Published in Bird Observer, April 2002The Massachusetts Avian Records Committee (MARC) was formed to evaluate reports of rare and difficult-to-identify species, as designated on its review list. The MARC also evaluates any new state record, and records of species that are geographically or temporally rare. Previous MARC reports appeared in the October 1995, August 1997, December 1998, February 2000, and April 2001 issues of Bird Observer. Readers may also find copies of these reports at the MARC web site. This year marked the addition of two new species to the MARC’s official state list, bringing the total to 468 species. Unusual waterfowl reports consistently provoke animated discussion within the MARC due to the difficulty of determining whether a species is a true vagrant or simply an escape from a collector of waterfowl. Reports which have been accepted by the Committee are those which follow an established pattern of vagrancy. A Cinnamon Teal seen for two days in March of 2000 was ultimately decided to conform to this pattern, particularly in the light of recent eastern North American records. This decision moved the species from the MARC’s “Supplemental List” to its main list (see below). 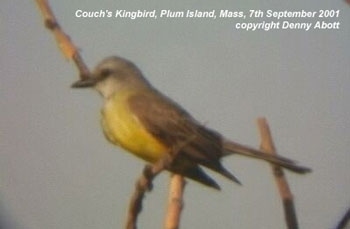 ATropical Kingbird spent several weeks in Hingham in November of 2000, and only ten months later a Couch’s Kingbird made a one-day visit to Plum Island. These two species are virtually impossible to differentiate based solely on field marks, but each has a diagnostic call note which allowed eventual identification and acceptance by the MARC. MARC members include Steve Arena, Jim Baird, Rick Heil, Chris Leahy, Jan Ortiz, Wayne Petersen, Jackie Sones, Richard Veit, and Trevor Lloyd-Evans (Chair). Marjorie Rines is the Secretary. Pacific Loon (Gavia pacifica) #01-01, Gloucester (Essex), January 18, 2001, J. Smith, S. Lerman; #00-23, Scusset Beach (Plymouth), November 22, 2000, S. and J. Dinsmore. Increasingly, this species is practically an annual winter and spring visitor, occasionally with more than one report per season. Western Grebe (Aechmophorus occidentalis) #98-22, Attleboro (Bristol), December 23-26, 1998, G. Valade, S. + L. Hennin. A large, black-and-white grebe discovered on an inland reservoir was identified as a Western Grebe, the details clearly eliminating the previously unrecorded Clark’s Grebe as a possibility. Seen by numerous birders, the Committee received written documentation from only one party, but were nevertheless convinced that this was the species involved. Yellow-nosed Albatross (Thalassarche chlororhynchus) #00-17, Penikese I. (Dukes), May 6, 2000, C. Mostello and G. Repucci. Two researchers were observing terns from a blind on Penikese Island when they realized that a large bird that they were watching was an albatross. During the 45 seconds they watched it from the blind, it passed as close as 10 meters from their point of observation, at which point they were able to easily pick out the bird’s unique bill and under wing pattern along with “the white top of the head shading to grayish neck and nape,” all indicating an adult of the nominate race chlororhynchus. Exiting the blind, the observers were able to see the albatross again as it landed on the water, noting its large size compared to the gulls in the area. There were a number of reports of (presumably) this same individual elsewhere along the northeastern seaboard in the spring of 2000. This represents only the third record for Massachusetts. White-faced Storm-Petrel (Pelagodroma marina) #01-14, Hydrographer Canyon, August 27, 2001, M. Sylvia, photographs by S. Mirick. Two individuals were seen by numerous observers on a dedicated birding trip to offshore waters. While no written report was received, excellent photos published on the internet were considered by the Committee. Anhinga (Anhinga anhinga) #97-34, Carlisle (Middlesex), September 16, 1997, J. Smith; #01-06, Avon (Bristol), June 19, 2001, R. Titus. The similarity between a flying Anhinga and cormorant is strong, and in the past the Committee has rejected a number of sight records of Anhinga due to insufficient documentation of the differences. Two reports were accepted: the 1997 observation was made by an observer unfamiliar with Anhinga, but was accompanied by an excellent field sketch made at the time of observation which the Committee found compelling. The 2001 record was by an observer who was extremely familiar with the species, and who wrote a detailed and convincing report. Ross’s Goose (Chen rossii) #01-09, Chilmark (Dukes), October 14-22, 2001, T. Rivers, J. Trimble. A single adult Ross’s Goose was discovered with a flock of Snow Geese at a farm on Martha’s Vineyard. Written details were accompanied by excellent photographs. This is only the second accepted record of this species in Massachusetts, the first being of two birds in Sunderland in 1997. “Black” Brant (Branta bernicla nigricans) #00-26, Plymouth (Plymouth), November 4, 2000, J. Trimble. Subspecies are not on the MARC’s review list, but there is nothing to prohibit the Committee from acting on such a report. B. b. nigricans is a western subspecies which is rare in Massachusetts. Perhaps soon to be a candidate for species status, partial DNA analysis of Black Brant and Pale-bellied Brant (B. b. hrota) has revealed that these two forms are more distinct from each other than are Ross’s and Snow Goose. The Taxonomic Advisory Committee of the Association of European Rarities Committees is also currently considering the status of the taxon. This bird, discovered among a large flock of the Atlantic Pale-bellied form (B. b. hrota), was well documented in writing, and was accompanied by photographs. Garganey (Anas querquedula) #00-10-A, Plum Island (Essex), August 4-11, 2000, R. Heil et al. A male in eclipse plumage was discovered associating with a flock of Gadwall, and later some Blue-winged Teal. Written details were accompanied by photographs published on the internet and, as with the Cinnamon Teal described above, identification was not in question. Garganey has been on the State List for several years, but the timing of this sighting did not fall into any established pattern of vagrancy, provoking some question of origin. Ultimately, it was agreed that, given the similarity of eclipse-plumaged teals, vagrants could easily evade detection at this time of year, so the report was accepted. Tufted Duck (Aythya fuligula) #01-03, Westport (Bristol), March 18, 2001, M. Lynch and S. Carroll. Tufted Ducks have become almost routine in Massachusetts, with many individuals returning to the same location year after year. This female may well have been the same as one reported from Westport on March 25, 2000. Only female Tufted Ducks are on the MARC’s Review List. Gyrfalcon (Falco rusticolus) #00-14 Plum Island (Essex), November 18 to December 10, 2000, R. Harlow et al. This northern visitor often stayed out of sight in the Plum Island marshes, but thrilled the many who were lucky enough to see it when it rose to hunt. It was carefully described as a gray morph, but late in its visit there were scattered reports of a dark-morph bird; however, these sightings were early in the morning when the low light put the bird in silhouette, and color could have been very difficult to judge. South Polar Skua (Catharacta maccormicki) #00-16, Stellwagen Bank, July 17, 2000, P. Trull. Clearly photographed by a researcher (and experienced birder) on a whale watch boat, this skua was an exceptional sighting for Stellwagen Bank. The observer attributed the occurrence to the easterly winds off Cape Cod preceding the sighting. California Gull (Larus californicus) #00-19, July 17, 2000, Chatham (Barnstable), B. Nikula and R. Heil. A third-summer bird at South Beach in Chatham was picked out of the masses of other gulls by two experienced observers, who were able to compare it to a number of Lesser Black-backed Gulls in the vicinity. This comprises only the second record of this species in Massachusetts. Bridled Tern (Sterna anaethetus) #00-13, July 17, 2000, Muskeget Island (Dukes), R. Veit. Bridled Terns are rare in Massachusetts, and historically reports have been clustered in August and September, so this individual was doubly exceptional. A group of three observers watched it as it flew over a pond on Muskeget Island, where it briefly landed, then took off again, affording good views of all the important field marks. White-winged Dove (Zenaida asiatica) #00-20, October 29, 2000, Edgartown (Dukes), M. Pelican. The observer was walking through some agricultural fields when he flushed a small flock of Mourning Doves. One bird instantly stood out by size and the presence of white wing patches. Although the view was brief, the observer was careful to eliminate the possibility of an oddly-marked Rock Dove. Selasphorus species, #00-21, Worcester (Worcester), October 7 to November 17, 2000, A. Pax and M. Lynch. #01-08, Granby (Hampshire), November 10-December 1, 2001, M. Lynch and S. Carroll. Any hummingbird seen after the end of the Ruby-throat’s normal migration in September should be looked at carefully. Both of these individuals were coming to feeders, and were initially thought to be Ruby-throats. Upon investigation by observers, both turned out to be female or immature Selasphorus. Ash-throated Flycatcher (Myiarchus cinerascens) #01-07, August 30, 2001, Belmont (Middlesex), M. Rines. At least a dozen records of this species have occurred in Massachusetts, but almost all in November or December, so the date of this sighting is highly unusual. It was, however, clearly seen for 20 minutes, with details provided of the bird’s small head and bill, pale throat and belly, and, most importantly, its distinctive call note. Tropical Kingbird (Tyrannus melancholicus) #00-11, November 8-30, 2000, Hingham, S. Avery et al. Since the similar Western Kingbird is not uncommon in November, it would have been easy for this first state record to slip by misidentified. Tropical Kingbird is virtually identical to Couch’s Kingbird, but the call notes are very different and this bird was obligingly vocal. Photographs and audio recordings were made available on the Internet, thus making the Committee’s decision fairly easy. Mountain Bluebird (Sialia currucoides) #00-15, October 27 to November 2, 2000, Concord (Middlesex), M. Rines et al. This bird was discovered foraging with a large flock of Eastern Bluebirds at the wastewater treatment plant adjacent to Great Meadows NWR. Seen and photographed by many, it is only the fifth state record for this species, and the fourth since 1994. Black-throated Gray Warbler (Dendroica nigrescens) #00-12, September 27 to October 2, 2000, Cambridge (Middlesex). K. and T. Kresser (detail M. Rines). A male visiting Mount Auburn Cemetery was seen by many. Swainson’s Warbler (Limnothlypis swainsonii) #01-04, May 11-June 6, Naushon Island (Dukes), T. Maloney, A. Jones, S. Storer. Birders participating in the Massachusetts Audubon Society’s Bird-a-thon were intrigued by an unfamiliar song, and with difficulty eventually were able to pick out a plain warbler with a brown cap and a large bill. Returning the following day, they were able to get photographs. This is only the second record of this species for Massachusetts. Henslow’s Sparrow (Ammodramus henslowii) #00-24, November 11, 2000, Dorchester (Suffolk), R. Donovan. An observer walking along the edge of the Neponset Marsh at a flood tide inadvertently flushed the bird, and got good, although brief, looks before it scuttled back into the grass. The description was compelling, and the bird’s behavior typical of this secretive species. Magnificent Frigatebird (Fregata magnificens) #01-05, Ashland, July 23, 2001. Although seen by an observer previously familiar with the species, the view from a moving automobile was brief and was unaided by binoculars, which led the Committee not to accept the report for such a rare species in Massachusetts. Pink-footed Goose (Anser brachyrhynchus) #99-24, Dennis (Barnstable), January 16 to February 20, 1999. Seen and photographed by many, this was unquestionably a Pink-footed Goose, but the report was turned down on the basis of questionable origin. A Pink-footed Goose seen in Connecticut in March of 1998 was accepted by the Connecticut rarities committee for the first accepted wild occurrence of this species in the lower 48 states. The MARC took the Connecticut committee’s thoughts into consideration, but remained concerned about the behavior of this goose, which allowed people to approach closely, giving cause to doubt it was of wild origin. Common Greenshank (Tringa nebularia) #01-02, Chatham (Barnstable), May 21, 2001. The details on this report were too sketchy to eliminate a number of other shorebird species. Yellow-legged Gull (Larus cachinnans) #00-25, December 28, 2000, Nantucket (Dukes). This 4th winter or near adult-plumaged gull was carefully observed and described by several experienced observers as possibly representing the race L. c. michahellis of the Yellow-legged Gull. The gull in question showed streaking on the head and sides of the breast, which ordinarily would not be present in a michaellis individual of this age, and the gonydeal spot should have been more conspicuous than as described. Because gulls are notoriously variable, and while none of the inconsistencies noted above categorically eliminate Yellow-legged Gull, the overall description could also not eliminate a hybrid, most particularly Herring Gull (Larus argentatus) x Lesser Black-backed Gull (Larus fuscus). The Committee struggled with this report before deciding not to accept it. Eurasian Collared-Dove (Streptopelia decaocto) #00-22, June 29, 1999, Northboro (Worcester). Neither the description of this bird nor the accompanying photographs could eliminate the very similar Ringed Turtle-Dove. The Eurasian Collared-Dove was introduced to the United Stated via the Bahamas in the 1980s and rapidly took hold in Florida, and sporadic sightings have been moving relentlessly north. It is undoubtedly only a matter of time before this species is recorded in Massachusetts. Townsend’s Warbler (Dendroica townsendi) #00-18, Gay Head (Dukes), September 28, 2000. As the observer commented, this was a “lamentably brief” view, during which several field marks were noted. The two observers believed it to be a Townsend’s, largely based on process of elimination, and the Committee was reluctant to accept on this basis.